No, not bino smells this time. I just received an old fashioned leather binocular case for my 7x50s- its in great like new condition, but the seller neglected to tell me that it seems to have been used to store smoking supplies. It REEKS of tobacco, something I do NOT want on my binocular, or near my eyes. The problem is how to deodorize this without a) ruining the felt lining on the inside and b) not leaving any residue that will end up on the binos. Expert advice sought, O Great Ones! Shake and Vac might work. There used to be an advert for it, "Do the shake n vac and put the freshness back" No Idea how you will get a vacume cleaner in there though. Perhaps you should leave it outside for a while. I had the same problem with the case of a military binocular. Fresh air and time seems to have done the trick. Perhaps closing it up for a while in a container with some baking soda. I have seen a small portable steam cleaner that looks like a tiny cannister vac. My boss owns one. It's great for steam cleaning small areas and odd spots that are hard to reach. It has an array of tiny nozzles that direct the steam into a variety of nooks and crannies. Put some commercial-grade smoke cleaner into the water and have at it. It should help. But if you don't own one, then I don't know if the price (about $89) is worth it just to clean a bino case. Something to consider though. The "commercial grade smoke cleaner" is some aerosol air deodorant we use at work - powerful stuff and kills every smell, even nasty stuff. I'll get the name and brand if you want. I think it's made by ZEP, possibly. Chop one boiled onion and mix with sliced smoked kipper , marinate with four tablespoons of Vic vapour rub and place in sealed case for 40 days . We are having a really fine morning in Los Gatos, California. The other day I was given a cigar and this morning I smoked a bit of it in the backyard next to my cement pond. It didn't smell nearly as bad as I thought it would. Maybe the gin helped? While I was out there I got to look at a Mourning Dove with my old Leica 10x32BA. Life is good. Fresh ground coffee (no water) is supposed to to be a potent deodorizer. I might try placing a half cup in the case and closing it up for a few days. Not sure how long the coffee smell will linger, but is should dissipate pretty quickly. Try wiping wiping the leather down with gin. It made my mustache smell better after smoking the cigar. No kidding. 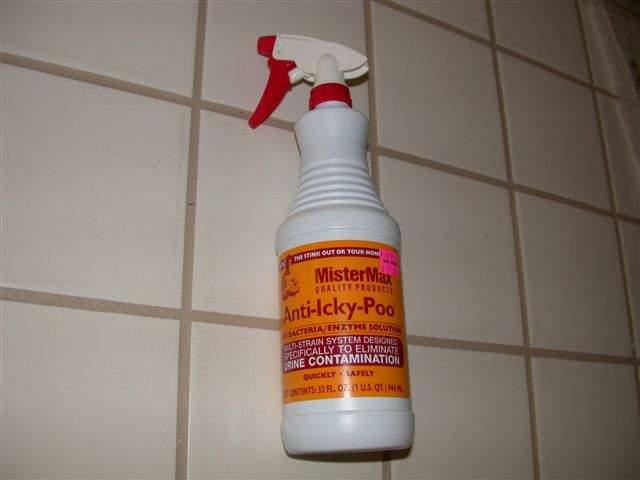 If that doesn't work well enough try Anti Icky Poo. It is the latest in active enzyme anti-odor products. You can find it at pet food stores. Spray it on and give it about three weeks. It is amazing how well it works. Uhm... Rich, how must gin have you had this morning? Hey, I was trying to edit it and the line died. That active enzyme product really works. I tried it on something a neighbor's male cat "marked". It took a few weeks but it did take the smell away. The enzymes to eliminate urine odor could be significantly different than those needed to eliminate tobacco products odors. BTW, it cost a significant amount of money to have a team of people perform the cleaning necessary to eliminate tobacco odor from a home before resale. I know Ed. It is also used to get rid of the smell of dead bodies. But, it may work on smoke. Looks like it should be called "STicky Poo"
The container appears to be sticking to a shower wall! No, it is not a floor and your right it's not sticking to a wall. 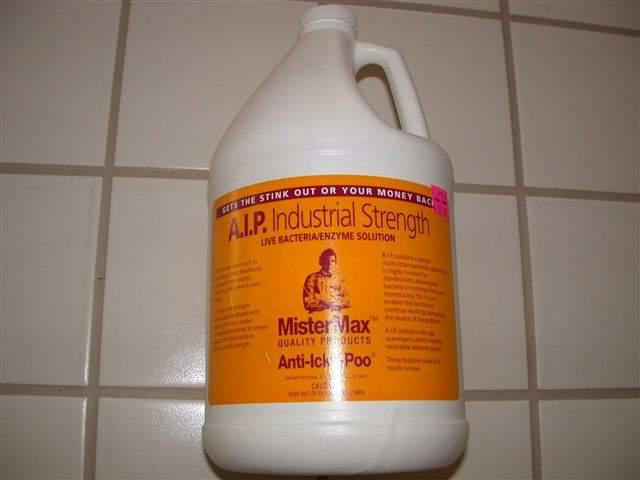 Preston is at work and his just breezing through posts, you can not post picture of Anti-Icky Poo containers. Ya see poor Preston laughs too hard and then all the other workers in the cubes near him hear him and its embarrassing. 1) First, steam clean the inside of the case and spray liberally with commercial grade deodorizer. 2) Then apply some "shake and vac" (aka Carpet Fresh) and then vaccuum the inside. 3) Apply baking soda. Allow to sit enclosed for several days. Vaccuum again. 4) Apply coffee grounds. Allow to sit enclosed for several days. Vaccuum again. 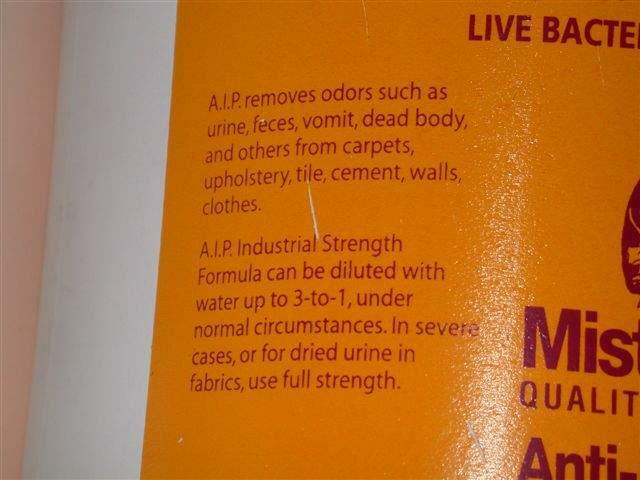 5) Apply Anti-Icky-Poo as per the instructions on the label. 6) Apply Kenny's recipe - "one boiled onion and mix with sliced smoked kipper , marinate with four tablespoons of Vic vapour rub and place in sealed case for 40 days." 7) After 40 days, remove the onion/kipper/vaporub mixture and vaccuum again. If after all of this, the case still smells of tobacco, then start drinking GIN until the tobacco smoke odor fades. This may take upwards to .25 liters (perhaps more) of gin for the full odor-elimination effect. Good luck....or, start smoking cigars all over the house and then everything will have the same aroma. During this process, learn to dodge objects thrown by the wife. The MisterMax website mentions getting rid of smoke but I'm not sure if it applies to Anit-Icky-Poo. I've called their 800 phone number and left a message. I bought way, way more of the Anti-Icky-Poo than I needed. It only took, I think, less than two ounces (about five squirts from the spray bottle). The job may have only needed a couple of squirts. Here is an interesting close up of the Anti-Icky-Poo label. Waaaaay too much information, though the part about dead bodies is kinda scary. So... Rich... have you been spraying Anti-Icky-Poo in the trunk of your car? That's right. I moonlight for the mob. My cover is amateur astronomy. Looking at all of the proposed solutions, it might just be easier to take up smoking so you don't notice the smell! Anyway, I stuck it in a zip lock bag with a couple of dryer fabric sheets for a couple days, and it worked quite nicely! Can't remember where I got the tip...might have been one of those Handy Homemaker or the like columns som'ers...but it did work. Wipe down the outside a few times with a dryer sheet, and stick a few inside the case, close it up, and let it sit for awhile. The smell will probably be more in the cloth, but leather is a bit porous, so that's why the wipedown.